There have been other claims of astrophysical evidence for a particular dark matter candidate, e.g the claim from the 3.5keV line? From my naive non-astronomer perspective I would think that a dwarf galaxy dominated by dark matter would be an especially interesting place to look for that signal. Are such studies out there? Also on the astrophysical front, the just published CIBER results appear to suggest that as many stars exist in intergalactic space as in the interior of galaxies. These intergalactic stars were not previously thought to exist in such vast numbers and are unobservable individually but can be inferred by collective EM emissions. So: billions of MACHOs and hundreds of billions of unbound rogue planetary-mass objects, and now countless intergalactic stars. Anybody ready to rethink the dark matter enigma? No signal was found, which puts some tension on the other detection claims but does not rule them out conclusively. Finding stars in intergalactic space is important, but it won't help us understand galaxy rotation curves, which were the original motivation for hypothesizing the existence of dark matter. Indeed, my recollection is that there have been some problems even with missing baryonic matter, and finding all of these stars between galaxies certainly helps with that. But it won't explain galaxy rotation curves, and hence won't resolve the dark matter question. Two of the three populations I mentioned are clearly galactic. Neither were widely expected; there may be well be other galactic populations of dark objects that have yet to be found. The CIBER populations are, in the words of the authors, "outside of galaxies (with boundaries as traditionally defined)", but that qualifier should not be ignored. Galactic halos may be much more extended than is conventionally assumed. A little rethinking of the dark matter problem, in the absence of 30 years of bias, might be a good idea. I'm not gonna give the secret away that WIMPs do not exist because they would not allow a Galaxy filled up with WIMP seekers. I just say: Go on, search and you will find. It is unfortunate that so many of the physicists who look so hard for the dark matter have such a weak command of the astronomical data that indicate its existence. I've lost count of the number of physics colloquia I've sat in where rotation curves are invoked with me being the only person in the room to have published papers on them. There are good, widely known arguments that there should be WIMP dark matter. There is also considerable, if less well known evidence to contradict this interpretation (e.g., section 4 of http://relativity.livingreviews.org/Articles/lrr-2012-10/fulltext.html). All we really know is that current theory can't explain the data. If we find WIMPs experimentally, great - Nobel prizes all around. But if we don't, how do we know when we've been barking up the wrong tree? (3) The cause of the initial clumpiness in the universe, as seen in the CMB. (4) Gravitational lensing of objects with no know massive objects between us and the object. Jester, what are (are where?) the constraints on WIMP masses from above? How high they could go while staying consistent with Standard model? The upper limit on WIMP masses is around 10 TeV. Heavier dark matter is possible but it could not be produced thermally. @Jester: I expect to see commentary relatively soon from those groups associated with the now ruled out detections. If my memory serves, some of those were made with pretty emphatic announcements of statistical significance. Looks like a tough day for the GeV excess. Could you write an entry explaining these latest results for some of us non-experts? The signal regions shown by Brandon Anderson do not reflect the uncertainties in the Milky Way dark matter halo profile---nor were they intended to reflect these uncertainties. Only the Abazajian+ 1-sigma region has one important uncertainty: the local dark matter density, which is uncertain to ~30% and is amplified due to the density-squared nature of the signal. 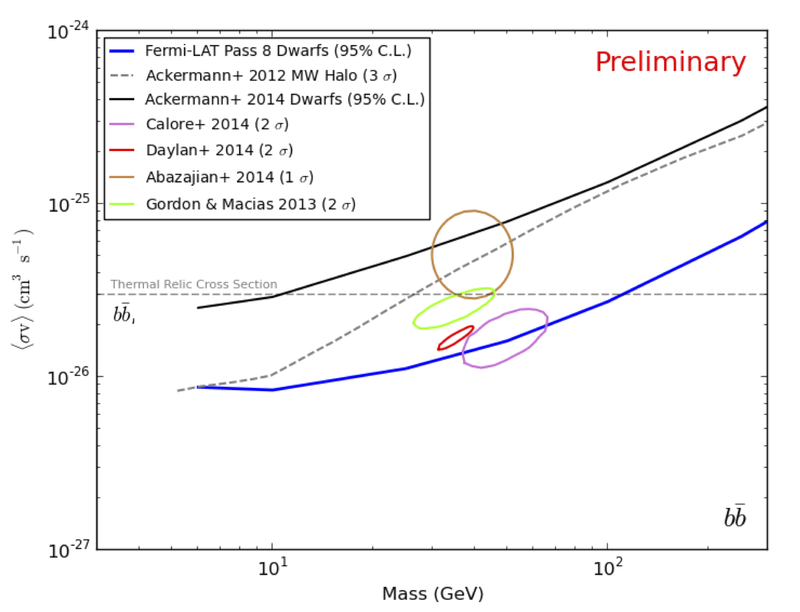 My rough approximation of the profile uncertainties is shown here.